Cable rallied into falling daily cloud, pulled higher by weaker dollar on disappointing US data. Fresh bullish acceleration neutralized downside risk seen after double long-legged Doji candles on Tue/Wed, keeping in play broader bulls from 15 Aug low at 1.2661. The Bank of England kept rates unchanged at 0.75% in widely expected action after the central bank raised interest rates in August and now leaving markets to digest the decision. The central bank is widely expected not to take any rate decision until Brexit divorce process is completed, but indicated further rate hikes at a gradual pace and according to the evidence from the economy. 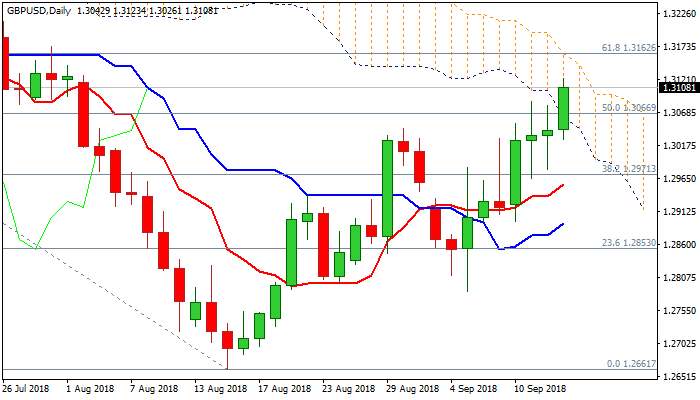 Daily tech show bullish momentum building and supporting further advance, as bulls look to generate fresh positive signal on break and close above daily cloud top (1.3162), also Fibo 61.8% of 1.3472/1.2661 fall. Meanwhile, bulls might be delayed as daily slow stochastic turned sideways in overbought territory and on track to generate bearish signal for consolidative / corrective action. Broken cloud base marks solid support at 1.3060, which should ideally contain corrective action and keep bulls intact. Only return and close below 55SMA (1.3013) would sideline bulls for deeper correction.